Synthetic peptide within Human Musashi 1/ Msi1 aa 74-101 (N terminal) conjugated to Keyhole Limpet Haemocyanin (KLH). The exact sequence is proprietary. 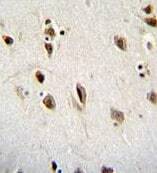 CEM cell lysate; Human brain tissue; CEM cells. ab170378 was purified through a protein A column, followed by peptide affinity purification. Our Abpromise guarantee covers the use of ab170378 in the following tested applications. WB 1/100 - 1/500. Predicted molecular weight: 39 kDa. RNA binding protein that regulates the expression of target mRNAs at the translation level. Regulates expression of the NOTCH1 antagonist NUMB. Binds RNA containing the sequence 5'-GUUAGUUAGUUAGUU-3' and other sequences containing the pattern 5'-[GA]U(1-3)AGU-3'. May play a role in the proliferation and maintenance of stem cells in the central nervous system. Detected in fetal kidney, brain, liver and lung, and in adult brain and pancreas. Detected in hepatoma cell lines. Belongs to the Musashi family. The first RNA recognition motif binds more strongly to RNA compared to the second one. Immunohistochemical analysis of formalin-fixed, paraffin-embedded Human brain tissue labeling Musashi 1 / Msi1 with ab170378 at a 1/50 dilution followed by peroxidase conjugation of the secondary antibody and DAB staining. 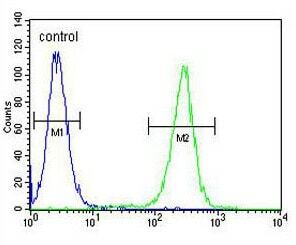 Flow cytometric analysis of CEM cells (right histogram) labeling Musashi 1 / Msi1 with ab170378 at 1/10 dilution, compared to a negative control cell (left histogram). FITC-conjugated goat-anti-rabbit secondary antibodies were used for the analysis. ab170378 has not yet been referenced specifically in any publications. Publishing research using ab170378? Please let us know so that we can cite the reference in this datasheet. There are currently no Customer reviews or Questions for ab170378.